No Denying Deflation: Will It Eventually Kill Content? In classic economics, deflation – a downward trend in prices – is a dangerous force that leads to recessions (see: Japan, economic disaster – a case study). In the world of the Internet, deflation viewed as a positive force, leading to massive consumer gains. How can we reconcile these two competing beliefs? And what impact will this deflationary pressure have on the production of high quality content? I've been thinking a lot about deflation and its impact on the Internet economy since reading two articles in two different newspapers this last week. 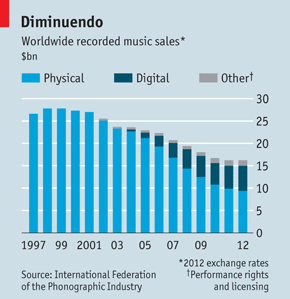 The first was this article in The Economist about the music business. The article contained a chart showing music industry revenues peaking in 1999 at $27 billion and dropping consistently as a result of the disruptive power of digital music and iPods/iPhones. Industry revenue may have finally flattened out at $16.5 billion, but the bigger story is that over $10 billion of value has been taken out of the music business thanks to over a dozen years of digital disruption. Artists are still producing a ton of music (I would guess music proliferation has grown during this period, although I haven't seen the data), yet the Internet has produced massive deflationary pressure. The second article that I was struck by was in the Wall Street Journal, depicting the explosion of online video. Titled, "Web Video: Bigger and Less Profitable", the article reports on the rapid growth in online video views (39 billion in December), yet the fact that prices are dropping rapidly due to the oversupply of video inventory. The CPM (cost per thousand views) that advertisers are paying has dropped from $17-25 in 2011 to $15-20 in 2012. Advertisers and content producers are used to this trend. Whenever a new advertising medium emerges, prices are high at first, and then steadily drop as inventory swells (I wrote about this in a post that provided a bearish analysis of Groupon back in 2010). Every content business today faces this rapid drop in CPMs across every category, resulting in severe cost pressures. So if the producers of music, video and other content are getting hammered on deflation, who is benefiting? Consumers. Consumers are getting access to music, video and other sources of content for less. They're also getting subsidized by business advertisers through social networks and search. McKinsey did a study a few years ago that sized the consumer surplus from the Internet at over 100 billion euros. Interestingly, they concluded that in measuring this surplus, consumers have benefited 85% of the gains from the Internet as compared to 15% for producers. Thus, while the business press is full of stories of disruptive gains in business transformation, the real story of the Web is the power of the consumer and the massive gain consumers are receiving. Although I am thrilled with the consumer surplus, I struggle with where this logical chain is eventually leading us. I worry that if there is too much deflation in content, that this consumer surplus will hit a natural limit. That natural limit will be that content producers will stop investing to produce high quality content. After all the inefficiencies have been wrung out of the system, eventually fewer producers of content will be willing to produce great content because the rewards just are no longer there. If this were to happen, consumers would be all the poorer for it. My conclusion: although deflation has produced awesome consumer gains in the last decade, it is emerging as a real threat to content producers. But at some point, perhaps soon, it will tip to being a negative force that will cause high quality content produers to turn away and pursue other methods of financial gain. If that were to happen, we might regret allowing deflation to run rampant on the Web. Similarly, the start-up world has evolved into a set of shared beliefs and values. For example, the notion of Pay it Forward has become a core part of the entrepreneurial ethos. In religious communities, when someone is in need, the community rallies around them. People do kind things to other people just because it is the right thing to do. The start-up world has a similar share value – investors, CEOs and service providers throughout the entrepreneurial ecosystem are always willing to lend a hand, donate time and provide guidance and counsel. When I talk to entrepreneurs I've never met before, I always have a sense that we are kindred spirits on a shared journey. There is an immediate connection and mutual respect, just as I feel when I meet a member of my religion (Judaism). The cultural force of entrepreneurship is a powerful one. This force and the cultural norms they impose can vary from the profound (it is no longer ok to look down on the "little guy/gal" in business, young people are now listened to more carefully and given more opportunities to have an impact) to the mundane (it is now ok to wear jeans to a serious professional meeting, it is no longer ok to pull out a Blackberry in a meeting as opposed to the iPhone). The binds that tie the community together are strong. I can walk into a start-up event in Sao Paolo, Jakarta or Little Rock and have the same dialog about the same concepts – just as I can when I walk into a synagogue on Friday night anywhere in the world and feel at home.